The Turfgrass Research and Education Centers at three of the University of Georgia’s campuses demonstrate the remarkable design efforts by Garbutt Construction Company and Clark Nexsen architecture to provide the university with state of the art facilities to better service their needs in the field of turfgrass research. The design of these multi-functional buildings now provides students and researchers with a space that conforms to their specific needs all under one roof. These new facilities include a greenhouse with separate zones for each researcher, a head house for prepping, dry goods storage, classrooms, an office suit, and multiple laboratories. All three facilities include a greenhouse with a fully automated energy system that controls the heating and cooling, a head house for dry goods storage, prepping, and research space. 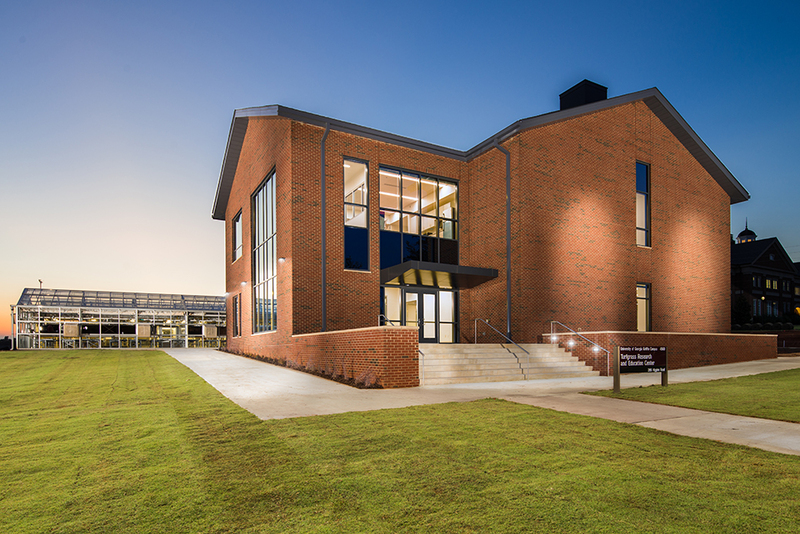 The first floor of the Griffin Turfgrass Center includes the greenhouse, head house, and dry goods storage, while the second floor houses the laboratories and an office suit for researchers, faculty and graduate students. Located directly adjacent to turf plots, the research can transition to the field and still maintain close proximity to the research laboratories. The innovative design of these buildings furthers efficiency and communication among researchers. UGA’s new turfgrass centers provide students with all the necessary tools for making breakthrough discoveries in the field of turfgrass research.